Astronomers have pushed NASA’s Hubble Space Telescope to its limits by finding what is likely to be the most distant object ever seen in the universe. The object’s light traveled 13.2 billion years to reach Hubble, roughly 150 million years longer than the previous record holder. The age of the universe is approximately 13.7 billion years. The tiny, dim object is a compact galaxy of blue stars that existed 480 million years after the big bang. More than 100 such mini-galaxies would be needed to make up our Milky Way. The new research offers surprising evidence that the rate of star birth in the early universe grew dramatically, increasing by about a factor of 10 from 480 million years to 650 million years after the big bang. Astronomers don’t know exactly when the first stars appeared in the universe, but every step farther from Earth takes them deeper into the early formative years when stars and galaxies began to emerge in the aftermath of the big bang. “These observations provide us with our best insights yet into the earlier primeval objects that have yet to be found,” said Rychard Bouwens of the University of Leiden in the Netherlands. Bouwens and Illingworth report the discovery in the Jan. 27 issue of the British science journal Nature. This observation was made with the Wide Field Camera 3 starting just a few months after it was installed in the observatory in May 2009, during the last NASA space shuttle servicing mission to Hubble. 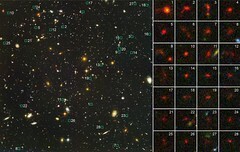 After more than a year of detailed observations and analysis, the object was positively identified in the camera’s Hubble Ultra Deep Field-Infrared data taken in the late summers of 2009 and 2010. The object appears as a faint dot of starlight in the Hubble exposures. It is too young and too small to have the familiar spiral shape that is characteristic of galaxies in the local universe. Although its individual stars can’t be resolved by Hubble, the evidence suggests this is a compact galaxy of hot stars formed more than 100-to-200 million years earlier from gas trapped in a pocket of dark matter. The proto-galaxy is only visible at the farthest infrared wavelengths observable by Hubble. Observations of earlier times, when the first stars and galaxies were forming, will require Hubble’s successor, the James Webb Space Telescope (JWST). The hypothesized hierarchical growth of galaxies — from stellar clumps to majestic spirals and ellipticals — didn’t become evident until the Hubble deep field exposures. The first 500 million years of the universe’s existence, from a z of 1000 to 10, is the missing chapter in the hierarchical growth of galaxies. It’s not clear how the universe assembled structure out of a darkening, cooling fireball of the big bang. As with a developing embryo, astronomers know there must have been an early period of rapid changes that would set the initial conditions to make the universe of galaxies what it is today.